CoLocalizer Pro is a pixel-based quantitative colocalization analysis software. It combines the power of its unique background correction tools with the implementation of the already established algorithms to estimate colocalization quantitatively. CoLocalizer Pro software is leveraged by the leading scientific laboratories worldwide and is a de facto standard in this field of research. Quantify colocalization in fluorescence microscopy images by calculating specialized coefficients. 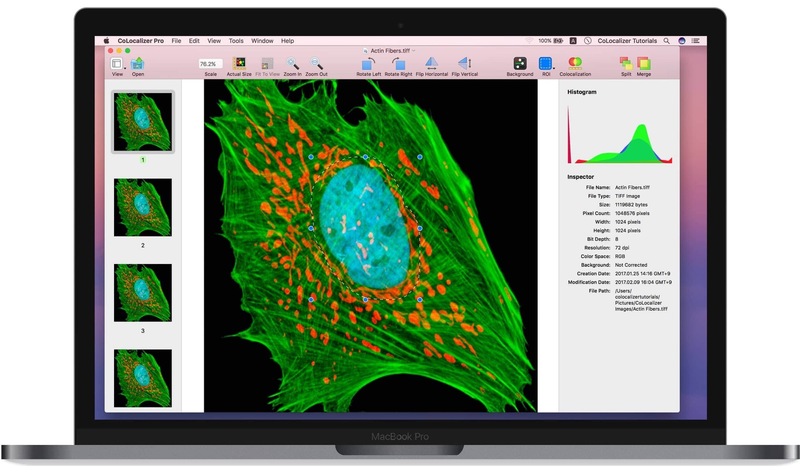 Access your images via iCloud and pass them between your Macs and iPads using Handoff. Correct background in the images to ensure the reliability of quantification. Open images in proprietary file formats, such as LSM, OME.TIFF, and other TIFFs. Connect to a microscope and import images from it right into CoLocalizer Pro for analysis. View images with colocalization at different magnifications and angles, merge single channel images or split merged ones according to a pair of channels. Export calculation results in various file formats, such as Excel, PDF, and HTML. Save versions of analyzed images and revert to the originals, if needed. Export results as colocalization reports with all the coefficients and image data stored conveniently in one place.